There is no day I anticipate and welcome as much as Winter Solstice. Like many of my fellow Pacific Northwesterners, I am a diagnosed Vitamin D deficient. I crave light with the trembling desperation of a junkie. Every morning from the Winter Solstice through the end of February, I note the sunrise and sunset, confirming the day is a minute longer than the day before. Then two minutes. Until one day, though it is still Winter, I’m running in 6:00 a.m.dawn. Winter Solstice is the true beginning of my new year, a day without the entanglements of religion, gifts, resolutions, overeating or travel. It is a day for reflection and remembrance, for letting go and looking forward. This year I felt a particular need to mark the turning of the season. The last day of 2012 and the early months of 2013 were filled with darkness; at the time it was hard to imagine a way forward. Yet, by the time we reached the Spring Equinox, we’d transformed our lives. Like sunflowers following their heliotrope instincts, we’d turned our faces to the light. I wanted to acknowledge that transformation as this year of turmoil, transition and finally, peace, drew to a close. I’ve practiced yoga for many years, but with the exception of some weepy Savansanas (Corpse Pose, a lying-down meditation) after a particularly intense practice, I’ve avoided its mystical elements. Not out of skepticism or indifference, but from an acknowledgment that there is only so much a busy brain and body can focus on. My practice has been physically and mentally transformative and I’ve benefitted emotionally from the residual grace of active meditation. This Winter Solstice offered me the opportunity to take part in a unique celebration that was also a fundraiser for a local center for victims of domestic violence. The event was a group ceremony of 108 Sun Salutations. A Sun Salutation is a series of 8 or 12 poses performed in a flowing sequence, following the natural rhythm of yogic breathing—deep inhalations and exhalations. The number 108 is sacred in many Eastern religions, which you can explore here and here, but I most enjoy knowing there are 108 stitches on a baseball and that Stonehenge is 108 feet in diameter. And now I enjoy knowing I can move though 108 Sun Salutations non-stop and not hobble, wince or otherwise regret it the next day. We were instructed at the beginning of the three hour practice to set an intention for our evening. My intention was to allow gratitude to carry me through the physical challenge. Gratitude for a strong, healthy body. Gratitude for opportunities to do the things I love, in a place of beauty and community. Gratitude for the love which surrounds me. Gratitude that even in a time of darkness, my husband and I had each other and we had the strength and the resources to change our lives. The women who seek help from places such as Dove House are in crisis; they have few, if any, resources left. I offered this practice in gratitude for an organization that supports, shelters and empowers women and children escaping domestic violence. Completing 108 Sun Salutations was humbling, exhausting and soul-stirring. I left my body behind and focused on one breath after another to make it to the end. The collective spirit of our community brought light and breath to women and children in need. I’m grateful for the opportunity to have given and received so much in return. Wishing all a gracious embrace of the darkness and a glorious return to the light. You wouldn’t know looking around our small apartment that Christmas is but a few sleeps away. We’ve forgone our annual wet and windy visit to the Boy Scout Troop 100 Christmas Tree lot at St. Alphonsus Church across the street from Ballard Market. Although the stack of holiday greetings grows daily, the cards and letters remain unopened, as do the boxes of cards I bought for our own missives. I won’t be watering poinsettias well into March because neither red nor white bloom graces our table. I can hardly be bothered to light even a candle. We’ve decided to keep our heads down and plow through the rest of this year without celebration. Maybe we fear attracting any more attention from higher powers that seemed to hold the screw to us during 2012. Maybe we’re just weary. Maybe celebration right now feels wrong. But I can’t stop myself from yearning for light, from reaching for the promise of renewal that the Solstice offers. It is not Christmas that holds my wonder and feeds my anticipation. I absolved December 25th of unreasonable expectations and spiritual significance some years ago. I just like the lights on the tree. It is this ancient tradition of honoring evergreens and the burning of bright light in the darkest days that allows me to find solace in the Solstice. I think upon this day as the year’s end, the time to pause and reflect as the seasons shift and the earth stutters, then marches resolutely toward Spring. This was a year when light and dark were in constant flow, when the weight of deepest sorrow was counter-balanced by the relief of joy. Yet I come to the Solstice feeling smaller somehow, a bit shrunken and defeated by the 365 days that have passed since the night last receded, then grew full again. I watched as a loved one received the death sentence of a terrible, prolonged disease. A few weeks later life inside me stilled once again, even as I imagined names and hair color, tiny hands to hold and a little voice calling after me. I’ve had to stand idly to one side, fists clenched, heart pounding in rage, as the person I adore and respect most in the world agonizes over present and future and what little control he has over each seemingly stolen away. I’ve looked in the mirror at a body that seems hell-bent on thwarting every good thing I try to do for it, forcing me twice under a surgeon’s knife and taking away in recent weeks the one thing that brought me endorphin-surging physical release. I’ve had to accept that many of those who’ve known me the longest are the least interested in discovering who I have become. And then, in the last days of this year, my voice joined the chorus of rage and grief as a stunned nation absorbed, helplessly, the news of the slaughter in Newtown. And yet there is light. There is laughter. There is deep happiness and certain peace. There is the celebration of twenty years of marriage – defying odds set against two very young people who knew one other five months before vowing to spend a lifetime together, listening to their hearts instead of their heads. I’d do it all again. One hundred times again. It takes my breath away to think how easily we could have slipped past each other during that busy, distracted spring of 1992, never to know what soul mate meant. There were winter days in medieval ruelles of Paris and late summer afternoons in Irish meadows. Hundreds of miles of Seattle pavement under my running shoes (and there will be hundreds more, believe me: Body and I are working out the terms). 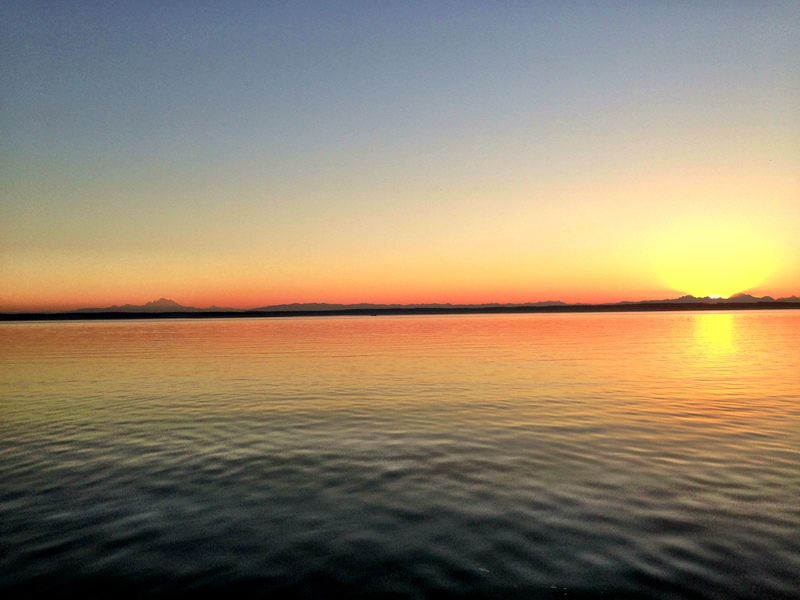 Sunsets over Shilshole Bay. The sweet joy of new friendships blooming. The unexpected embrace of a colleague who says, “Things are better with you here.” Laughter, dancing, beer and music in a beautiful community that is home, with spirited and loving people who are my family. And there are my words, my sentences, paragraphs, pages. The slowly but steadily growing word count on a manuscript which has become my anchor, my refuge, my way – thank you, Richard Hugo – of saying the world and I have a chance. Perhaps Hugo meant that by the act of creating art, the world and I have chance together. And that perhaps I can, I should, I must, use my words to pursue what I believe is right and try to create good out of so much sadness. 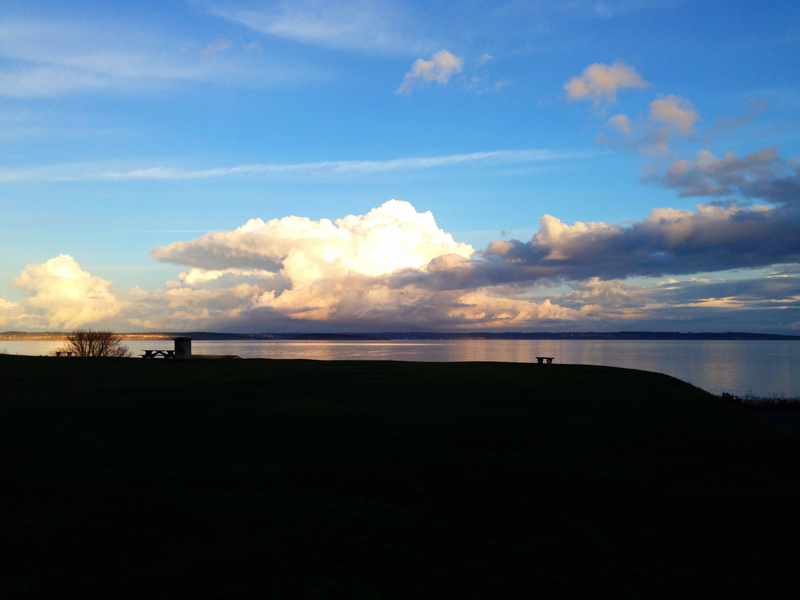 Brendan and I went for a long walk late in the afternoon of this, the shortest day. I’m not one for portents, but I’ll share this photo I captured of a Bald eagle against the cerulean sky and diamond-bright moon. I’ll take the raptor’s presence as the last blessing of this long season of darkness and be grateful for a moment of grace, no matter what the next seasons may bring. Attributed to Abraham Lincoln. No matter who said it, I like it. Winter Solstice. The words sparkle like starlight reflecting off snow. They whisper of the chill of dusk that falls heavily into long night. They hold the glow of windows warmed by firelight and candles, opaque with the steam of hot soup and rich cocoa. It is year’s most mysterious night, when the sun abandons an entire hemisphere and Winter stakes her claim in the frigid void. For thousands of years humankind has sought to chase away the demons of ice and darkness by creating legends and rituals of light: Yule, Saturnalia, Yalda – traditions predating Christianity which celebrate the inexorable march of the seasons. From the depths of winter’s darkness rises the promise of light – this is the great beauty of Solstice. It is a beginning. Each day Winter slips in a moment more of light, as slowly and stealthily as an icicle melting in a minute of January sunshine. But the moments build. Suddenly, about the time you are tying a bow on a box of chocolates for your Valentine, you realize that skies which once dimmed at 4 are still streaked with sunset at 5:30. I vow this year to relish the dark, to delight in the cold, to embrace a season that is as fleeting as Spring. It is the time of year when I can read a novel in an afternoon, curled on the sofa, safe from the descending dark and rain and free from the distractions of sunlight and warmth. The projects I’ve put off all year suddenly become the only things I want to do- the scrapbooks, the correspondence, practicing the guitar, the all-day cooking sessions, thumbing through my old Italian textbooks, trying to see all the Best Picture Oscar nominees before the March ceremony. Inside things that should be done only when the weather outside is frightful. Our Christmas tree is brightly lit and festooned with memories in shapes of snowmen, St. Nicholas, reindeer, and shimmering globes, and it lifts my heart when it glows solitary in the darkened room. I have always been anxious to dismantle the tree as soon as the clutter of holiday gifts has been cleared; this year I will leave it to lighten our spirits into the New Year. I will celebrate this turning point from darkness to light, but promise not to turn so quickly toward Spring that I miss the beauty and mystery shimmering just inside Winter’s gloom.